A police standoff with an armed man who reported having explosives in his vehicle briefly halted traffic on Northern California's busiest bridge during Thursday's morning commute. The 51-year-old man, described by authorities as mentally unstable, called police around 7 a.m. after pulling over on the upper deck of the San Francisco-Oakland Bay Bridge and threatened to blow it up, said California Highway Patrol spokesman Sgt. Trent Cross. A man claiming to be the driver of the SUV called local radio station KCBS' Phone Force line during the standoff, CBS San Francisco reports. KCBS producer Ted Goldberg said the man had told the radio station that he was upset because his wife had been cheating on him and was going to leave him. Authorities halted all westbound traffic on the upper deck as officers negotiated with the man, who could be seen standing outside his vehicle, talking on a cell phone. His 16-year-old daughter managed to escape from the vehicle during the hourlong standoff. Cross said the man, an emergency medical technician, reported being upset over a family issue. He brandished a gun, then threw it over the railing into the water. After convincing him to surrender, officers passed him a pair of handcuffs and he put them on and turned himself in, Cross said. The man's name was not immediately released. Authorities found no explosives in his vehicle. The highway patrol reopened some westbound lanes shortly after 8 a.m., though traffic remained snarled throughout the morning. Eastbound lanes on the lower desk were kept open during the incident. The U.S. Coast Guard also responded to the incident. The Coast Guard "closed the waterway under the bridge and have established a safety zone," Lt. Steve Warner said. 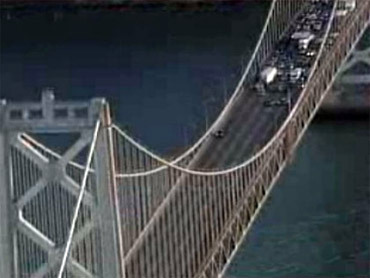 An average of 280,000 motorists use the Bay Bridge each day.